The 2012 Kookaburra 1/2 oz gold proof coin is part of a limited selection of proof golden coins included in a special low mintage edition of the Perth Mint’s "Discover Australia" series. Considering its history and specifics, the coin is considered a bargain: struck on 24 carat gold in proof quality, it comes in attractive presentation packaging comprising a wooden luxury box and hardboard wrapping depicting a scene of Australia’s landscape. Other coins in this collector’s series include the pioneer Red Kangaroo, the Green and Gold Bell Frog, the Goanna and the Whale Shark. Why buy the 1/2 oz "Discover Australia" Proof Kookaburra gold coin? This coin is mainly targeted at collectors looking for the best. Rarity (no more than 500 1/2oz coins were issued) is the main reason for the relatively high, but in no case unreasonable premium (the lowest in the set), since the name, the 24 karat purity, the superb manufacturing quality and presentation, together with the proof finished impeccable design suggest that you should get your money back manifold if you ever decide to sell the best Kookaburra in your collection. It carries the authentic 'P' mintmark, it is a certified issue of the Perth Mint and a Numbered Certificate of Authenticity is provided adding great numismatic value to the only gold Kookaburra piece. 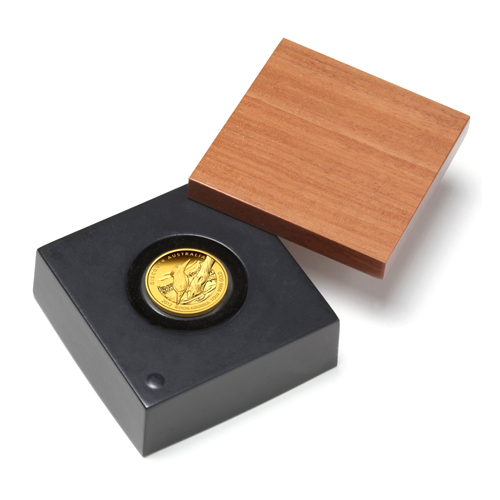 The 2012 Kookaburra 1/2 oz gold coin weighs 1,560 g of 99.99 % pure gold in proof quality. The coin is 25.60 mm in diameter, its thickness is 2.40 mm and it carries a face value of AUS $50. Officially approved by Queen Elizabeth II, her Majesty’s latest effigy by Ian Rank-Broadley embellishes the obverse of the 2012 ½oz Proof Gold Kookaburra. The Queen's name is inscribed along the top-left quarter of the rim, "AUSTRALIA" to the right of her portrait, and the legal tender denomination of AUS "50 DOLLARS" at the bottom, with bullet points on each side. The reverse features an endearing depiction of a Kookaburra as it feeds clenched on an impressively designed tree growing in water with a charming landscape in the background. The inscriptions are "DISCOVER AUSTRALIA" "KOOKABURRA," the "P" mint mark, as well as the year of issue, purity, and weight engraved on the rim of the two-toned surface of the coin. The Kookaburra is currently considered the flagship coin series of the Perth Mint, although the Perth Mint’s one tonne gold coin features a red kangaroo on its reverse side. The silver Kookaburras were first introduced in 1990 and met with remarkable acceptance by the investor community. The coins initially featured Queen Elizabeth’s sculpture of Raphael Maklouf, set in a proof finish. Presently, the series features 26 issues in its silver range, each with a unique image of the most famous bird in Australia. Appealing to investors and collectors, the Kookaburra series maintains uniqueness in the precision concave of surfaces, resulting in a meticulous design unrivalled by most other Mints. The one ounce editions limited to half a million pieces are highly prized and almost instantly sell out. The 2012 "Discover Australia" proof coin is as yet the only Kookaburra struck in gold. There are only 500 pieces in the market. The specifications of the 500 numbered 2012 ½ oz Gold Proof Kookaburra makes even the thought of attempting forgery sound like a folly. Any responsible dealer would assure you that the coin is so well furnished against counterfeit that any fraud will be easily detected. A leading dealer in gold bullion products, CoinInvest buy and sell 2012 ½ oz Gold Proof Kookaburras at rates that are hard to beat. To purchase your coins you simply add the desired quantity to your basket by clicking on the orange strip in the volume pricing section. Should the coin be available in stock, we will immediately process your order, but you should allow at least 10 working days for delivery, as some bank transfers do not reach us for up to 7 days depending on your bank and country of residence. If on the other hand you have 2012 half ounce Gold Kookaburra coins in your collection that you wish to sell, do come in contact with a member of our friendly staff to discuss a price and prepare a fixed fee offer for a limited time only. We will send you confirmation of the offer by email.